*This method requires enough remaining pipe stub from the old siphon to clamp the Fernco coupler to. If no pipe stub is available, use the "Foam and Cement" method. *The Flout can use the old trap or the old vent. When using the vent, a new vent should be provided. Use a tee instead of the elbow. The trap is sealed off with mortar. *Provide a shim such as a d-box cover or a built-on shim to keep the Flout body at or above the invert of the elbow or tee. 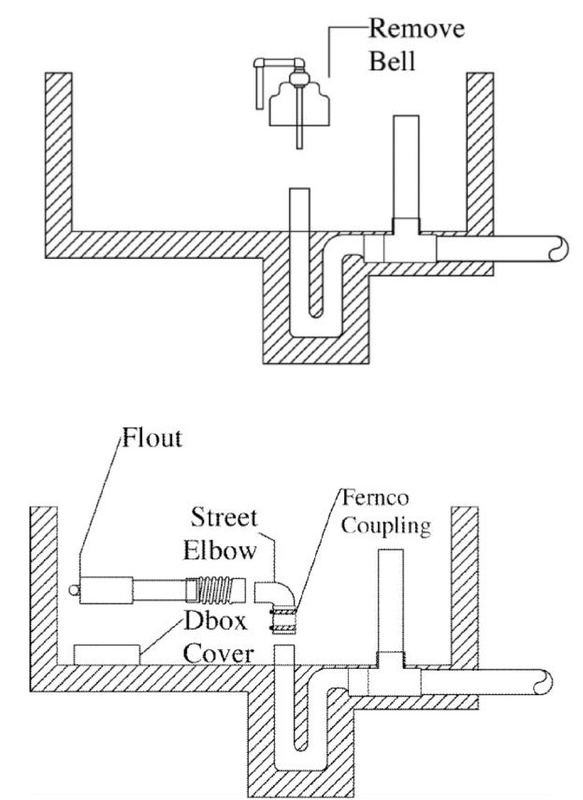 *With the Flout held straight up, the bottom of the Flout’s weir must be lower than the top of the vent or chamber inlet invert.